Nothing says Holidays quite like a white, red, and green palette. I partnered with Tommy Hilfiger to bring you a little more than the average post. As the Holidays roll around, a few things instantly come to mind: movies, traditions, seasonal dressing, and decorating. I wanted to incorporate a few of these things into today’s post. 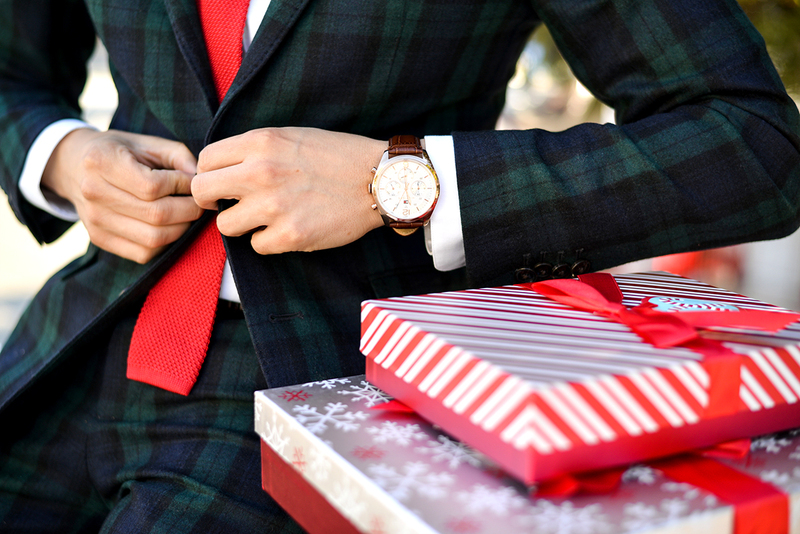 I began with a suited look inspired by Christmas and all of the Holiday cheer. This blackwatch plaid print is among my favorites this time of year. It’s rich enough to be festive, but subtle enough for work and parties. Since the suit is printed, I wanted to maintain a clean silhouette by adding a white shirt, red tie, and a shiny new pair of loafers. The holiday colors are ever present, and the shoes bring a classy feel pulling everything together. My second look was inspired by one of my favorite movies: The Holiday. Jude Law’s character, Graham, is from London, which to me is always synonymous with killer style. In the movie, he is always polished, and looks sharp head to toe. Keeping with the Holiday theme, I decided to tie these two elements together by wearing a printed shawl collared sweater, denim, and brogues- naturally. I was able to incorporate white and red- neutral seasonal colors- with my shirt and tie, just like in Look 1. Another element I used to transition between my two holiday outfits was my Tommy Hilfiger dress watch. The croc embossed strap and rose gold indices offer the perfect balance to class-up your look. I feel like the touch of rose gold adds a new approach to the classic timepiece, and is very fashion forward. Accessories are extremely important to completing your look as they add compliments in subtle ways, while making a big impact. If you don’t know where to begin with accessories, try a dress watch, an move froward from there. For other Holiday inspired posts, make sure to follow along with the #TommyHilfiger hashtag.